Hundreds of workers at Ford's Bridgend plant who make engines for Jaguar cars are being paid to stay at home for a week. The five-day shutdown is happening because the company is stopping production at its assembly plants at Solihull for a fortnight. The affected staff, on the AJ line, will get basic pay during the break. Wales' First Minister Carwyn Jones said he wanted assurances the move was only temporary. News of the shutdown has caused fresh anxiety for those at the plant - one of the biggest employers in Wales. A Welsh Government spokesman described the news as "obviously concerning for workers". He added: "Senior officials from the Welsh Government have spoken to Ford today and are meeting officials from Unite the Union tomorrow to discuss the shutdown and other matters regarding the future of the Bridgend plant." Meanwhile, the effect of the cutback in production by Jaguar Land Rover (JLR) is spreading beyond Bridgend. GSM Automotive in Brecon, Powys has confirmed that its orders from JLR have stopped for the time being while JLR's plant in Solihull is on a two-week shutdown. JLR's plant at Castle Bromwich, Birmingham, is also on a three-day week due to a fall in orders. JLR accounts for 65% of GSM's orders. The company employs 130 people making car interiors. Its chief executive Andrew Farthing says they will not be laying off staff because it was challenging to recruit people with the right skills in the Brecon area. Until orders pick up, he is trying to increase orders from other companies. Other Welsh companies which supply JLR are also affected. They hope that work for JLR will go back to normal after the two week shutdown but that is far from certain. 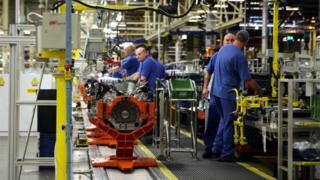 It's unusual for unions in a plant like Ford Bridgend not to have been told of the production line shut down in advance. In this instance, I understand letters were sent to staff before the unions had been told. And this all comes during a time of tension across the car industry. Sales are down, particularly of diesel vehicles and car makers are increasingly anxious about the impact and uncertainty surrounding Brexit. Jaguar Land Rover recently said that if the UK government did not get "the right Brexit" it would cost them more than £1bn a year - and lead to big job losses. Last week, Ford's European boss Steven Armstrong warned a no-deal Brexit could affect the company's future in the UK. And in 2017, it was announced production of engines for Jaguar Land Rover would end three months earlier than expected.